To the uninitiated, these six bikes all look the same, but nothing could be further from the truth. In fact, you can divide the six bikes in the “2017 MXA 250 Four-Stroke Shootout” into three distinct groups based on the one attribute that matters most in modern 250cc racing—horsepower. Two of the six make 44 horsepower. Two others make 40 horsepower, and the final two make 38 horsepower. That spread in power is the tale of the tape. It divides the six bikes into three groups, leaving gaps that you can only ignore at your own risk (or mitigate with your wallet)..
Before we get into the nuts and bolts of MXA’s 2017 250 shootout, we should mention that there is no such thing as the best 250 four-stroke. It doesn’t exist. Why? MXA test riders understand that one rider’s preference is another’s problem. So, while test riders might like certain aspects of a given bike, they have to decide for themselves if they are willing to sacrifice other traits (e.g., brakes, clutch, weight, etc.) to focus on that one element alone. In this test the MXA wrecking crew has tried to provide a sound understanding of each bike’s positive and negative qualities. We didn’t ride these bike for one day with six test riders and call it a day. No! We raced them every weekend for months. We raced them hard. We swapped test riders constantly, we adjusted spring sag hundreds of time, we fixed the things we broke, we broke things we fixed and we learned more in our six months than we can share in any one test. We understand that if you’re a loyal Honda CRF250 owner, you won’t like this test. Why would you? You have $8000 invested in us being wrong. Sadly, for you, we aren’t wrong in terms of which bike meets the standards of performance that we set. And, we know that you think that sending the suspension out for a revalve, buying an Ti exhaust pipe, putting a Hinson clutch in the cases, porting the head, changing the cams and adding different offset triple clamps will make any of the losing bike into a winner. You could be right. However, the parts we listed above will cost you $4000 dollars. Plus, we promise you that it would take $4000 in engine parts alone to make the four of these bikes produce the same amount of horsepower as the other two. Before you rush out to buy the “2017 MXA 250 Four-Stroke Shootout” winner, we suggest that you look closely at yourself, your riding style and your real needs. Once educated, the choice is up to you. And yes, we do rate the bikes in order of our test riders’ preferences, because if we didn’t, it wouldn’t be a shootout, would it? It’s hard to believe that the 2017 RM-Z250 only makes a 1/2 horsepower more than it did seven years ago. Over the same time span, the KTM 250SXF gained 8 horsepower. WHY SHOULD THE SUZUKI RM-Z250 WIN THE SHOOTOUT? The 2017 RM-Z250 is a very fun bike to ride. It corners so well that MXA test riders are willing to overlook the engine’s failings just to dive inside of every rider on the track. It is quick, agile and free-feeling. It can hit any line in any turn. WHY SHOULD THE RM-Z250 LOSE THE SHOOTOUT? Suffice it to say that when you read “2017” in this test, it could just as easily mean 2016. Why? Because, mechanically, the 2017 Suzuki RM-Z250 is the 2016 RM-Z250 (and the 2016 Suzuki RM-Z250 wasn’t very good either). WHAT’S NEW ON THE 2017 SUZUKI RM-Z250? Nothing important. The 2017 bike is the 2016 Suzuki RM-Z250 with a yellow rear fender, new graphics and black anodized doodads replacing last year’s red-anodized trinkets. 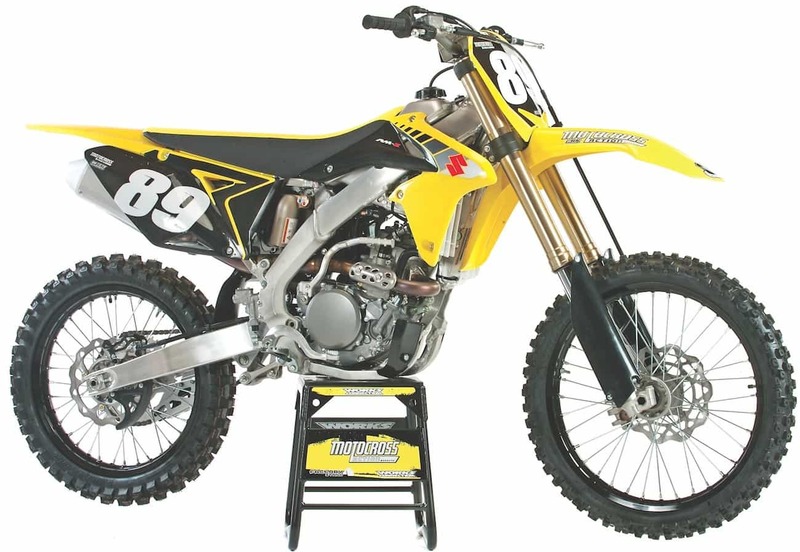 WHAT DOES THE RM-Z250 WEIGH? HOW DOES THE RM-Z250 RATE IN THE MAJOR CATEGORIES? Power output: Poor. This engine is not fast. It lacks throttle response, aggressive hit, adequate over-rev or competitive ponies. It is, at best, a Novice engine. It picks up nicely off the bottom and has pep into the midrange, but it is the only bike that we had to downshift to keep drive going on steep uphills. Suspension: Good. Suzuki ran Showa SFF single-spring forks in 2013–2015, but for 2016–2017 they switched to Kayaba PSF-2 air forks. Suzuki’s version of PSF-2 forks differs from Honda’s in that the high- and low-speed rebound damping clickers are on the top of both fork caps, while the compression damping is on the bottom. Honda has its high- and low-speed compression clickers on one fork cap and its high- and low-speed rebound clickers on the other fork cap. Handling: Very good. The RM-Z250 has long held the distinction of being the best-turning bike in its class. Suzuki discovered its magical frame geometry formula 20 years ago and has stuck with it. It can hit inside lines with very little rider input, but can also blast around sweeping turns with relative accuracy. The only downside to the RM-Z250’s geometry is instability at speed. The solution? Slide the forks down in the triple clamps, tighten the steering-stem nut, and carefully adjust the race sag (it affects the frame’s head angle). Every MXA test rider was willing to trade some straight-line stability for the RM-Z250’s precise cornering ability. Brakes: Poor. Every manufacturer, save for Suzuki, switched to oversized front brake rotors in order to keep KTM’s awesome Brembo brakes in sight. In a strange symbiotic relationship, the Suzuki RM-Z250’s weak brake is in line with its weak horsepower. If it were faster, it would overpower the little front rotor. WHAT DO WE HATE ON THE RM-Z250? The weak clutch. It’s never a good thing when a manufacturer trades feel on the showroom floor for performance on the racetrack. 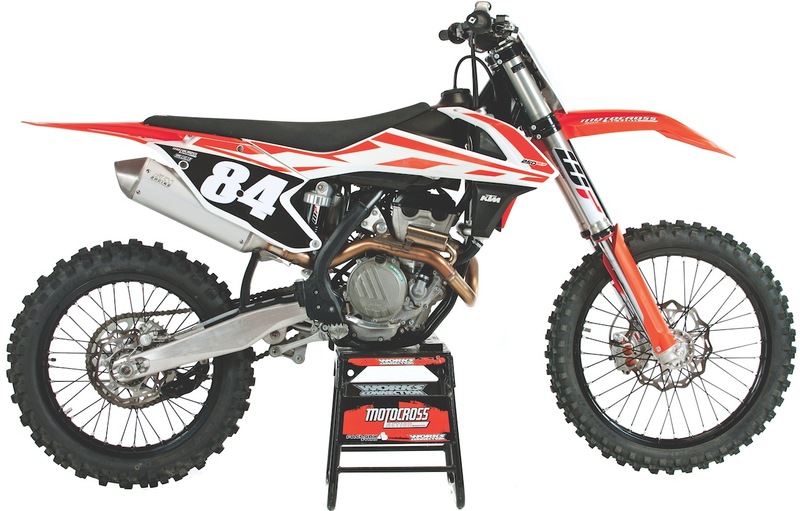 We don’t recommend spending money on hopping up a Honda CRF250, because your bank account isn’t big enough to make it as fast as a KTM is on the showroom floor. WHY SHOULD THE CRF250 WIN THE SHOOTOUT? The Honda CRF250 should win because it is a really good bike suffering from benign neglect, budget constraints and a flawed design philosophy. Every MXA test rider wanted to love the CRF250 because of how cool it feels on the track. If there weren’t lots of faster bikes around to point out its deficiencies, this would be the 2017 MXA 250 shootout winner. WHY SHOULD THE HONDA CRF250 LOSE THE SHOOTOUT? Horsepower is not the end-all, be-all of a shootout, but a total lack of horsepower is a deal-breaker. Finding 5 horsepower to run with the Austrian duo will not come cheap. Honda’s 2017 horsepower numbers were competitive back in 2009, but with the exception of the Suzuki RM-Z250, none of the other manufacturers are living eight years in the past. They have moved on. WHAT’S NEW ON THE 2017 HONDA CRF250? With the Honda R&D department’s attention focused on the new CRF450, the 2017 Honda CRF250 got short shrift. The 2017 CRF250 is the 2016 CRF250, right down to the left-over graphics, plastic and configuration. WHAT DOES THE CRF250 WEIGH? 224 pounds. We have to wonder why Honda’s engineers stick with the silly twin pipes. 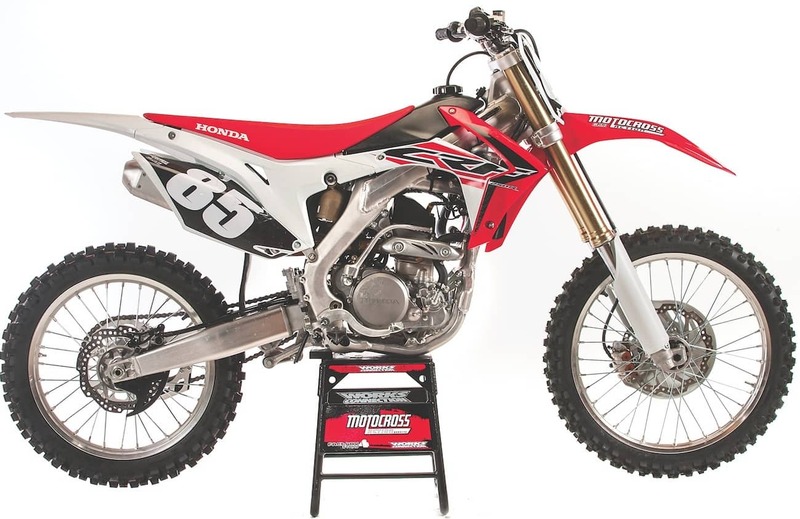 The CRF250 would weigh 222 pounds with a single exhaust system. HOW DOES THE CRF250 RATE IN THE MAJOR CATEGORIES? Power output: Fair. The 2017 Husqvarna FC250 makes 44.34 horsepower, leaving the CRF250 almost 5.5 horsepower in the dust. In dyno terms, the 2017 Husqvarna FC250 (44.34), KTM 250SXF (43.76), Yamaha YZ250 (40.93) and Kawasaki KX250 (40.05) are taking candy from a 38.89 horsepower baby. Suspension: Good. As far as air forks go, the Honda CRF250 has the best all-around feel of any bike with Showa SFF-TAC forks, followed by the KX450F. The MXA wrecking crew appreciates good forks wherever we find them, and we like Honda’s take on TAC; however, we believe that the forks are too complex for the typical teenage 250 four-stroke owner to live with. And, we know that Honda feels the same way. How do we know? Because the 2017 Honda CRF450 comes with coil-spring forks based in no small part on consumer studies conducted by Honda itself. Brakes: Fair. Proof that big 270mm rotors aren’t the ultimate cure. Clutch: Poor. Honda has been sucking wind in the clutch department for years. Like most cable-operated clutches, the CRF250 clutch is way behind the hydraulic units on the KTM and Husky. WHAT DO WE HATE ON THE CRF250F? Things are looking bad when a 2017 Honda CRF250 weighs 2 pounds more than a 2017 KTM 450SXF. 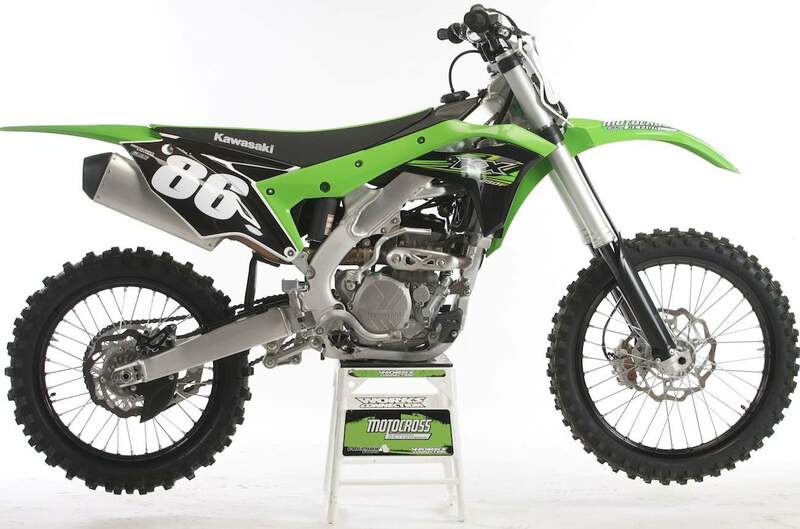 In our honest opinion, this is a much-better KX250F than in the past. It has very good handling, superb ergos, adequate suspension and a broad, easy-to-use powerband. WHY SHOULD THE KX250F WIN THE SHOOTOUT? The 2017 Kawasaki KX250F is much better than in the past. Unlike in 2016, the handling had been improved, ergos ironed out, suspension upgraded and powerband spread out. The new engine is smoother than the old engine and still cracks the 40-horsepower mark. We applaud Kawasaki for paying so much attention to chassis, weight, ergonomic and suspension details. The 2017 KX250F chassis is a breath of fresh air. The bike feels balanced, tracks straight and enters corners with precision. This makes the bike effortless to ride. WHY SHOULD THE KX250F LOSE THE SHOOTOUT? Although this is the best KX250F ever, it’s not a complete package. It needs improved forks, a better-modulated front brake, a stronger chain guide, more rear brake-pedal adjustment, better protected air vents, more power and a more defined powerband. WHAT’S NEW ON THE 2017 KAWASAKI KX250F? The 2017 KX250F engine is totally new, including the injector angle for the dual-fuel system and lighter flywheel (but heavier cranks). The big-end rod bearing is now a bushing. Additionally, the 2017 KX250F frame mimics the KX450F frame in that it is an inch narrower across the spars, and the bike is 3 pounds lighter. WHAT DOES THE KX250F WEIGH? 221 pounds. Kudos to Kawasaki. They knocked 5 pounds off of the KX250F thanks to the new frame, plastic and engine castings. It is the third-lightest bike in the shootout. HOW DOES THE KX250F RATE IN THE MAJOR CATEGORIES? Power output: Very good. The 2017 KX250F lost some of its punch without losing any peak horsepower. The KX250F’s power is deceiving. Instead of hitting hard and rocking you back in the saddle, as it did in 2016, the 2017 KX250F’s power is more linear. It gets its 40.05 horsepower to the ground and tracks incredibly straight. There is no doubt that the MXA test riders miss the excitement of last year’s hard-hitting thrill ride, but we’re big enough to admit that we can go faster without it. Suspension: Good. Originally introduced in 2011, the SFF forks have had a rocky lifespan. With each passing year the baseline settings have improved slightly, as Kawasaki has focused on targeting a wider range of riders. The 2017 SFF forks are a big improvement over last year. They are much more tunable, easier to live with and, as a bonus, the coil springs don’t get air leaks. This is the biggest improvement that SFF has ever made, but the KTM, Husqvarna and Yamaha forks rank above them. Handling: Very good. The 2017 KX250F chassis is a breath of fresh air. The bike feels balanced right off the bat. If anything, it had a bit of oversteer, which was easily fixed by adjusting the spring preload on the forks by a few clicks. It entered corners with precision, and both ends of the bike followed each other extremely well, making it easier to put the bike where we wanted it. This made the bike a breeze to ride. Riders’ confidence skyrocketed with the precise handling and user-friendly interface. Brakes: Fair. The 270mm front rotor was a great addition to the KX250F package last year; however, you should bleed the brakes after break-in, because they are spongy from the factory. Clutch: Fair. The light feel of the clutch is awesome, but it doesn’t last. Put stiffer springs in or don’t use it. WHAT DO WE HATE ON THE KX250F? We have a love/hate relationship with the 2017 engine, largely because we loved the full-blast powerband of 2016. The 2017’s linear powerband is easy to ride and gets the power to the ground, but it’s boring. Of course, we are still iffy on the clutch, brakes, shifting and chain guide. It’s strange to say, but the 2017 Yamaha YZ250F is good because it’s not great — and it’s great because there is no aspect where it’s not good. Got that? WHY SHOULD THE YZ250F WIN THE SHOOTOUT? Yamaha can hold its head up high. It has won seven of the last 16 MXA 250 four-stroke shootouts, and has done so in dominating fashion for the last couple years. The 2017 Yamaha YZ250F should have won this year’s shootout, too, because it combines proven Kayaba SSS suspension with neutral handling, class-leading reliability and a do-it-all engine. The 2017 YZ250F is up in horsepower across the board and is exceptionally good in the low-end and midrange. It has won in the past on the overall rightness of its total package—it doesn’t have any major flaws. It is a good, solid machine. WHY SHOULD THE YZ250F LOSE THE SHOOTOUT? The YZ250F should lose this shootout because KTM kicked out the jams for 2017. In recent years the orange bikes have dominated in the power, handling, brake and clutch categories, only to throw the shootout win away with poorly performing forks. For 2017 the KTM has incredible air forks. It weighs 4 pounds less than the YZ250F and makes 3 horsepower more. The YZ250F should lose the 2017 MXA 250 shootout because this year KTM didn’t fumble the ball on the 1-yard line. WHAT’S NEW ON THE 2017 YAMAHA YZ250F? Yamaha made seven major engine changes for 2017. (1) The cylinder head has straighter intake tracts, a 4mm -higher intake port and 0.4mm-larger valve seats. (2) The rubber air boot’s velocity stack is shortened by 15mm. (3) The intake cam’s lift is increased by 0.1mm, while the exhaust cam has 0.5mm more lift. The added lift requires stiffer valve springs. (4) The exhaust-pipe diameter is increased from 36.5mm to 39.3mm as it exits the exhaust port and from 40.7mm to 43.0mm where it enters the mid-pipe. (5) The clutch plates disengage with wider spacing between the plates. (6) The rev limiter is set at 14,000 rpm. (7) Yamaha stiffened the 2017 chassis torsionally by widening the forgings 12mm at the swingarm pivot. WHAT DOES THE YZ250F WEIGH? 222 pounds. The Yamaha YZ250F is the only bike to gain weight in 2017. It went from 221 in 2016 to 222 this year. The culprit is the heavier forging in the swingarm pivot. HOW DOES THE YZ250F RATE IN THE MAJOR CATEGORIES? Power output: Very good. The Yamaha jumps up onto the pipe, pulls hard through the middle and revs out on top. It does rev quicker, but the big news is how torquey it feels in the transition up to that point. From 7000 rpm on, the 2017 YZ250F makes more horsepower than the 2016 model. Peak horsepower on the 2017 YZ250F is 40.98. Last year it made 39.88. Suspension: Excellent. Not as omnipotent as it once was, because the WP AER forks have closed the gap on Yamaha’s coil-spring Kayaba SSS units. These are still awesome forks and most MXA test riders felt that the fork springs were sufficient for a wide range of rider weights and speeds. No hassles. Handling: Good. 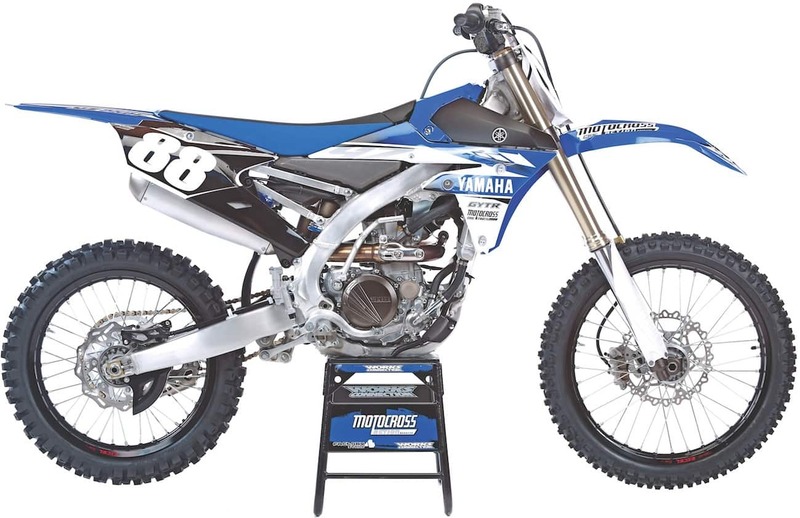 The YZ250 has never been a standout handler. It doesn’t have the all-around handling capabilities of the KTM and Husky, or the swivel-on-point quickness of the Honda and Suzuki. It’s a middle-of-the-road handling machine. . Brakes: Fair. To keep up with KTM, Yamaha went to a 270mm rotor; however, it doesn’t seem that Yamaha spent a lot of time fiddling with master-cylinder piston sizes to work with the jumbo rotor. The YZ250F brake was very grabby. Clutch: Good. In a left-handed compliment, the YZ250F has the best clutch of any Japanese-designed 250 four-stroke. WHAT DO WE HATE ON THE YZ250F? The excessive noise blasting out of the muffler and the airbox at the same time. Speaking of the airbox, there has to be a simpler way to get air into the engine than this Rube Goldberg-designed plumbing system. The 2017 Husqvarna FC250 makes a stunning 44.38 horsepower at peak, the most in the 250 class, but we would be remiss if we didn’t say that the 2017 Husqvarna FC250 is basically for people who don’t like orange. WHY SHOULD THE FC250 WIN THE SHOOTOUT? The 2017 Husqvarna FC250 is the horsepower king of 2017. It actually makes more peak power than its KTM brother. And, the way the Husky makes its power is mellower, slower-revving and more Novice-friendly than the orange bike. Every MXA test rider feels that the Husqvarna FC250 is more comfortable, absorbent and pleasant to race than the KTM 250SXF. Why? The three-piece plastic subframe feeds flex into the chassis and lessens harsh feedback to the rider. The addition of the WP AER air forks turned the fortunes of KTM and Husqvarna around. More accurately, they turned them from also-rans into shootout winners. WHY SHOULD THE FC250 LOSE THE SHOOTOUT? Thanks to its restrictive plastic airbox, the FC250 has a muted throttle response and slower rev than the class-winning 2017 KTM 250SXF. While the Husky makes more horsepower than the KTM, it takes longer to get there. On an engine that requires you to get to 14,000 rpm to achieve peak power, the delayed reaction makes it feel quite different. The truth of the KTM and Husqvarna pairing is that if one wins, the other has to finish a hair’s breadth behind it, because they are clones. In this case, the Husqvarna FC250 loses to the KTM 250SXF because it revs a little slower and weighs 2 pounds more, but beats all of the Japanese 250Fs because it is lighter, makes 44.38 horsepower, and has electric starting, a bulletproof clutch, great handling and awesome brakes. 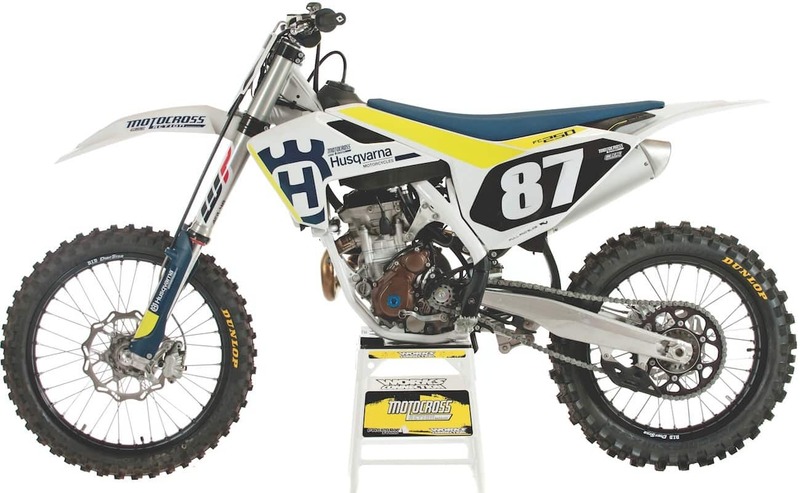 WHAT’S NEW ON THE 2017 HUSQVARNA FC250? The Husqvarna list mimics the KTM 250SXF list. WP AER air forks replace last year’s WP 4CS forks. The shock spring rate has been reduced from 45 N/m to 42 N/m. There is a new electronic map switch that controls maps, launch control and traction control. The rear brake pedal is 10mm longer. The top triple clamp is more rigid, and the top bar mount is one piece. WHAT DOES THE FC250 WEIGH? 220 pounds. You might be thinking, “If the Husqvarna is a clone of the KTM, why does it weigh 2 pounds more?” The answer lies in the molded plastic airbox, beefier swingarm and proprietary plastic design. HOW DOES THE FC250 RATE IN THE MAJOR CATEGORIES? Power output: Excellent. The FC250’s power is broad and ultra-usable by skilled riders. Since it revs slower than the KTM, it felt more manageable for less talented riders. Suspension: Excellent. WP’s AER air forks are ingenious in their simplicity. They have an air cartridge, similar in concept to a bicycle pump, in the right fork leg. There is only one Schrader valve on the AER forks, not three as on the SFF TAC forks. Since the air takes the place of the two coil springs in the previous WP 4CS forks, the weight savings is 3.6 pounds. All the damping is handled by the left fork leg via one compression clicker and one rebound clicker (they don’t have four different clickers like the Kayaba PSF-2 forks). Setup is simple. Find the proper air pressure for your speed and then click in your favorite compression and rebound settings. You can race these forks right off the showroom floor, and you don’t need an iTunes app to make sense of how they work. Good stuff. Handling: Excellent. Every MXA test rider prefers the feel of the Husky over the KTM even though the geometry is the same. There are two reasons the test riders felt that the twins were different. (1) Husqvarna’s three-piece plastic airbox is more resilient than KTM’s standard-issue aluminum tube structure. The flexier feel of the plastic makes the Husqvarna feel plusher and softer when landing from jumps or under heavy torsional loads in corners. (2) The Husky’s slightly mellower power delivery, which develops over a longer time, has the effect of slowing down reaction times for more overall control. Brakes: Excellent. Pucker up. Brembo has refined the interplay between the rotor, caliper and master cylinder to the nth degree. Clutch: Excellent. In this shootout, only the KTM and Husky have hydraulic clutches. They are self-adjusting, so they are easier on the clutch plates. They have double or triple the lifespan of a cable-operated clutch. The MXA test riders were split on whether Husky’s Magura master cylinder was better than KTM’s Brembo unit. WHAT DO WE HATE ON THE FC250? The molded plastic airbox: This design is better suited to enduro bikes. A motocross bike doesn’t need a watertight and airtight airbox. We drill holes in it. If you’re an aspiring Pro, then you’ve found your machine. It already makes works-bike power, weighs less than you will at 40 years old, and has a whole cadre of features that the Japanese brands might get around to in a few years. WHY SHOULD THE KTM 250SXF WIN THE SHOOTOUT? It should win because it makes the best overall power of all the 250 four-strokes. Plus, it weighs the least, and has a hydraulic clutch, incredible brakes and electric starting. It revs to 14,000 rpm and handles intuitively. It has plain bearings instead of needle or ball bearings, an ingenious air filter and the best air forks ever made. There are innovations on the 2017 KTM that the Japanese brands will not get around to for at least four years. WHY SHOULD THE 250SXF LOSE THE SHOOTOUT? This is a total-commitment powerband. You either go for broke or you come up bust. There’s no short-shifting in KTM City. The 2017 KTM 250SXF has no equal at full tilt, but if you are not ready to fully commit, then you are not ready for the 250SXF. It is a Pro powerband that isn’t well suited to Novice-level riders. WHAT’S NEW ON THE 2017 KTM 250SXF? The list is fairly straightforward. WP AER air forks replace last year’s WP 4CS forks. The shock spring rate has been reduced from 45 N/m to 42 N/m. There is a new electronic map switch that controls maps, launch control and traction control. The rear brake pedal is 10mm longer. The top triple clamp is more rigid, and the top bar mount is one piece. WHAT DOES THE 250SXF WEIGH? 218 pounds. Amazingly, the KTM is the lightest 250cc four-stroke, yet, it has an electric starter and battery. HOW DOES THE 250SXF RATE IN THE MAJOR CATEGORIES? Power output: Excellent. KTM 250SXFs have always had go-for-broke powerbands. The 250SXF makes its peak horsepower (43.79 horsepower) at the highest rpm the engine will turn over, which means 14,000 rpm. If you shift before 14 grand, you are leaving power on the table. The big plus of an engine that revs so high is that you don’t have to shift very often because it never stops pulling. If you are fast enough to live in the KTM’s high-rpm stratosphere, this is the fastest bike you will ever race. If you are slow, you might be even slower on the 250SXF. The key to success is to resist the urge to shift up. Suspension: Excellent. It is hard to believe that KTM could turn its fork fortunes around in a single year, but it did. The WP AER air forks first showed up in America on the 2016 Factory Editions, and KTM’s test department took what they learned from Factory Edition owners to re-valve the 2017 forks to perfection. You can race these forks right off the showroom floor, and, as a bonus, they make the rear shock and its new 42 N/m spring work better too. While Showa and Kayaba made a mess of the air-fork business, WP sat back and watched. Now that some of the Japanese companies are wavering on continuing down the air-fork road, KTM has built the simplest, easiest-to-use and most race-worthy air forks on the market. Handling: Excellent. Balance is the key to getting the most out of this terrific chromoly steel chassis. Brakes: Excellent. KTM’s Brembo brakes have embarrassed the Japanese brands into going to big rotors, but big rotors are only one third of a great brake system. KTM has all three aspects covered; the Japanese brands haven’t worked out the caliper and master cylinder interaction yet. Clutch: Excellent. If you are a clutch abuser, the KTM can take a lickin’ and keep on tickin’. WHAT DO WE HATE ON THE 250SXF? The sprocket bolts, spokes, plastic shock collar, tiny Torx bolts, the sticking gas cap and the fact that you can’t remove the pipe without removing the shock first make our hate list.